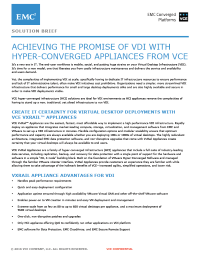 Download this white paper to learn how organizations can create a more streamlined VDI infrastructure with VCE hyper-converged infrastructure solutions. A company’s Virtual Desktop Infrastructure initiatives can be costly, complex and put a huge strain on their IT infrastructure. With VCE hyper-converged infrastructure solutions, organizations can implement a high performance VDI infrastructure in a way that’s fast, easy and affordable.